Make sure a study skills appointment is appropriate for you. Study Skills Advisers can assist with general academic skills – anything from academic writing to revising for exams. For more specific questions relating to your subject or the content of your assignment, your module leader is the person to see. If you’re looking for help with finding the best materials for your assignments, you may wish to meet with the Academic liaison librarian for your subject. Be clear on what you would like help with. Before you come to the appointment, think carefully about which areas you would like to talk about. This may be based on feedback you’ve had on previous assignments or something in your assignment brief you are unsure of. Reading through our online study skills guides can also help you to identify which skills you would like to focus on in more depth. Bring relevant materials with you. If you would like to discuss an upcoming assignment, it is helpful if you bring the assignment brief with you as well as a plan or draft of your work in progress. If you are looking to improve your skills based on some feedback you’ve had from a previous assignment, please bring a copy of the feedback with you so we can discuss it thoroughly. The more information you bring with you, the better we can tailor our guidance to your specific needs! Come prepared to do some thinking! Study Skills Advisers can give you strategies to help you with academic skills but we can’t tell you what to write – one to one appointments are a chance for you to work together with your adviser to apply the skills we teach you to your own assignments. 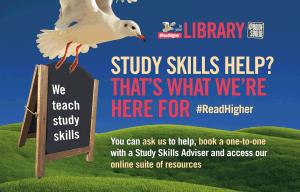 To request a one-to-one appointment with a Study Skills Adviser, please fill in the online booking form.